When I was in Japan last year I saw the flower buds of Petasites (aka butterbur) being sold as a seasonal vegetable in a small market in Yunishigawa. Of course I screamed out loud (as is my wont), and it was much to Cayce's credit that she neither fled nor visibly cringed with embarrassment. I hadn't realized it was edible. That evening we were served butterbur tempura, and later in the week we ate the stems of the plant as pickles and in stews. In the U.S., rumors of toxins keep many people from eating butterbur (and sassafras and hay scented fern and who knows what else), although it's frequently listed as an herbal remedy for migraines. The fear of inadvertent poisoning may be why I was unable to dig up any recipes (in English!) for butterbur flowers, other than the traditional tempura. Nonetheless, it's my first found edible plant this season and I'm thrilled to see it raise its flowery head. If anyone out there has a recipe for the flowers, please let me know. Otherwise, I'll wait till the flower stems (aka scapes) lengthen, then use them in stir fry or maybe pickle them. And of course, I'll continue to research any and all possibilities. I think the leaf stems (not the leaves themselves) may also be edible, as with rhubarb. Petasites flowers before the leaves emerge; in my garden the buds push up through last fall's leaves before I've had a chance to rake them off the beds. The scapes lengthen to about 8-10 inches as the buds open. 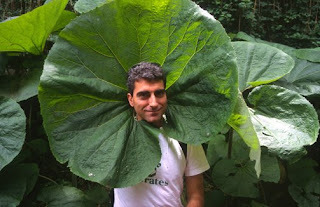 Next, large (and I mean LARGE) leaves unfurl. Petasites can be invasive, but the leaves are highly ornamental and when you need something to cover a lot of ground (shady, moist ground) it's very useful. And hey, if it gets out of hand you can always eat it! I think if you're not screaming at least a few times a year at some plant sighting, you're not gardening (or eating) passionately enough. So cool that you saw them in the market. That must mean they're not merely 'edible,' but somewhere up in the 'tasty' range. You are so right! Gardening and eating are two things that should be done passionately or not at all. I still haven't tried these as an edible and have been curious about the taste and texture ever since you discovered in Japan that they were edible. Love the pic of Mark with his butterbur collar! Thank you for posting about Fuki. I currently live in Tokyo and the other day I ran across fuki stems at my little neighborhood market and every house wife there was carrying around a few stalks. So, after trying to email my husband to google what the heck fuki is, I made a guess that it was a type of rhubarb and bought some. I still have not found any good recipes yet, but maybe if I ask a couple of ladies at work, some one will come up with something that sounds edible to my picky husband. Wish me luck... now if I could only find actual rhubarb. Then my world would be complete. If you find a fuki recipe, please share it with me! I'd love to try making it. Just because one species of Petasites is edible doesn't mean that they all are. I suspect the English variety may have a far higher concentration of pyrrolizidine alkaloids (PAs) than the Japanese variety. Foods like comfrey and coltsfoot which are also high in PAs are not poisonous and won't kill you. The concern is that, over a long period of time, the PAs can accumulate in the liver. Species do vary a lot - especially between continents. The Russian Comfrey (introduced to Britain) with the purple flowers has a far higher PA content than the native Common Comfrey with the cream flowers, for example. I have consumed butterbur sprouts, hand collected in the United States, as well as fed it to my significant other at the time with no ill effects. The species is much more palatable than marsh marigold. While your concerns are noteworthy, they represent a failure to test the information found in current literature, often subject to one's own language and culture. While bioaccumulation may be a concern, how much butterbur will a person really consume on an annual basis, when regarding the extremely seasonal nature of its edible parts? Sugar, gmos, inorganic produce, chemical food additives, and antibiotic pumped meat products place a much larger burden on the human physiology than a few meals of the edible parts of butterbur when in season. The above mentioned items are in the average person's diet year round, as they are not subject to seasonality due to their unnatural means of production. -Food for thought. The "above mentioned items" aren't specific known and proven carcinogens, they are handwaved generalities meant to vaguely illustrate the presumed harmlessness of 'natural' chemicals compared to commercial ones. That's a silly argument. Yes, you can probably eat a bit of this and a bit of that and not die of it. Some people do prefer to know what they're eating and gauge the chances they're taking on that basis, and I appreciate Monica's heads-up. Perhaps I don't eat just a few meals of butterbur, but rather a few meals of that, another few of bracken, another with seasonal mushrooms, a few capsules of harmless natural hypericum to top it off, and so on.